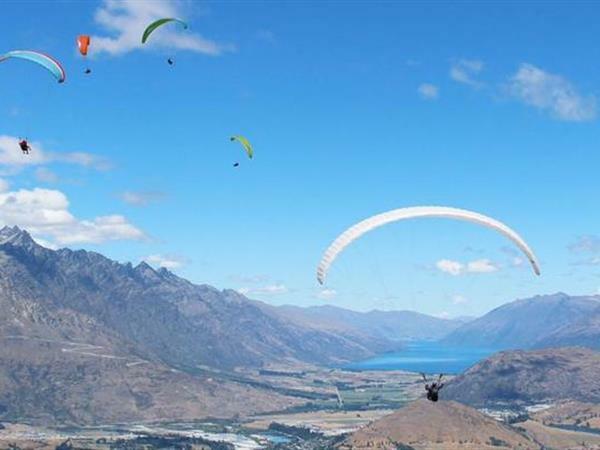 Skytrek Tandem Hang Gliding & Paragliding provides you with flights over Queenstown from Coronet Peak, located just 20 minutes’ drive from the city centre. Skytrek courtesy shuttle will pick you up from town and drives you to one of the launch areas ranging from 3800 feet to 5500 feet high. The highest commercial take-off in New Zealand! Your pilot will gently guide you through the steps required to become airborne with him, so you can enjoy the breathtaking views from Coronet Peak across the Queenstown Surrounds. The friendly and professional team of tandem pilots are highly experienced and will ensure your experience will be one to remember! If you're accompanying a fare-paying passenger, come along for the ride and enjoy the panorama (on a space-available basis)! Photos and videos are available using a GoPro that captures you, your pilot and the amazing scenery around you.